This January, Winterthur acquired at auction a canvaswork picture associated with a group of needlework made in the Boston, Massachusetts, area. This embroidery, circa 1750, was created by Mary Perrin of Roxbury, Massachusetts. In many ways, the needlework is in excellent condition and even retains its original frame. A very different object was revealed, however, when the work was removed from the frame. The culprit? Light damage! Light damage is commonly seen on textiles. To observe the effects in your own home, simply pull back a curtain that has been hanging for some time; the side facing the window likely has faded to a lighter hue. The effects of light are cumulative and non-reversible. So if you have ever wondered why many rooms in a museum are dimly lit, now you know. In addition to causing the fading of dyed materials, light can also make textiles brittle and yellowed. After 266 years of varying exposure, the front of Mary Perrin’s needlework has changed from a vibrant composition, still visible on the protected back, into the more muted picture on display today. 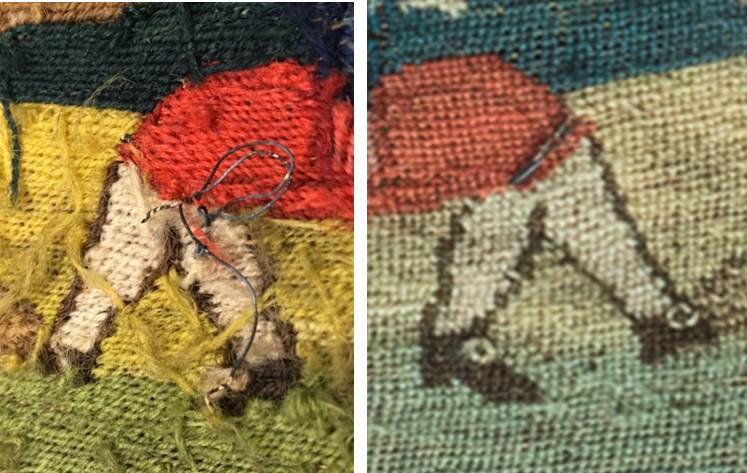 Details of a needlework picture showing the protected back side on the left and the light-exposed front surface on the right, Mary Perrin (1737–1815), Roxbury, Massachusetts, 1750, wool, silk and metallic thread on linen. Museum purchase with funds provided by the Henry Francis du Pont Collectors Circle 2016.66. Left: Back showing vibrant colors. Right: front, faded by light, as seen on display. This entry was posted in Academic Programs, antiques, Art Conservation, Conservation, Decorative Arts, museum collection, needlework, Students & Alumni, Textiles, Uncategorized and tagged antiques, needlework, Winterthur, Winterthur Garden, Winterthur Museum, Winterthur Museum Garden & Library, Winterthur Program in American Material Culture. Bookmark the permalink.